MARSHALL, Minn.— The Grow Our Own Summit on Nov. 8 brought 450 people to Marshall to focus on helping kids succeed and closing the opportunity gap for those living in poverty. Hosted by Southwest Initiative Foundation, the summit tied together national thought leaders and Minnesota success stories to inspire attendees and equip them to take action in their communities. In southwest Minnesota, approximately one in six kids lives in poverty, and too many kids in the region aren’t getting the best start to life. “Our rural communities are working from a position of strength. We have good schools, safe neighborhoods and a strong spirit of collaboration across sectors and communities. And we cannot let those assets lull us into thinking that it will all work out. We must envision what we want for our children and what we want our communities to look like 10, 20, 30 years from now and work toward that vision,” said Diana Anderson, SWIF president and CEO. Members of the partnership identified five strategies for mobility from poverty that align with Grow Our Own efforts in southwest Minnesota — change the narrative, create access to good jobs, create safe, caring communities, provide support that empowers and transform data use. Aside from the tangible challenges faced by families living in poverty, the US Partnership on Mobility explored how it’s also isolating and stigmatizing. Gigi Bisong, who shared her personal experience at the summit, said she felt judged by people for being young, poor and a single mother, even though she was trying everything she could to be successful. Bisong is a graduate of the Jeremiah Program, an organization that moves families from poverty to prosperity. The program “provided a pen and paper to write a new story,” and now Bisong works to empower other women who face the challenges she’s overcome. “There’s no judgement in my eyes when I see them. 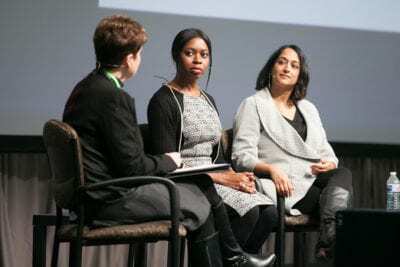 I see them at a heart level,” said Bisong, pictured here with Anderson and Patel on stage at the summit. Changing the narrative of poverty is something everyone can work toward, Patel told attendees. Businesses also have a role to play in setting our kids up to be southwest Minnesota’s next generation of employees, entrepreneurs, community leaders, volunteers, homeowners and parents. Speaker Keith Maki with Cascade Engineering, a Michigan-based, international manufacturer, shared the company’s innovative strategies to develop and retain workforce, including a successful “Welfare to Career” program and on-site social workers who can assist employees. As a certified B Corporation, Cascade Engineering considers the impact of its decisions on workers, customers, suppliers, community, and the environment. “We believe business is much more than making a profit,” Maki said, noting employee support systems benefit the company as well as the employees. And many employees need help, according to Ray Boshara, senior adviser and the director of the Center for Household Financial Stability at the Federal Reserve Bank of St. Louis. “More and more families are struggling today, despite the headlines (about a booming economy),” said Boshara, who shared the realities of family balance sheets across the country. He noted nearly half of all families don’t have funds to cover an unexpected $400 expense. Even those with jobs may not have accumulated assets, meaning employment isn’t always a good measure of success in terms of long-term financial stability. Boshara’s research shows the main drivers of wealth inequality are generational, educational and racial. “Age, race and education … determine thrivers and strivers in our country today,” Boshara said. An afternoon panel at the summit shone a light on three programs in southwest Minnesota seeing success. The panel emphasized a two-generation approach focused on creating opportunities for and addressing needs of both children and the adults in their lives together, with panelists (pictured) from REACH at Hutchinson High School, Parents Advocating for Student Success (PASS) at Worthington Public Schools and Renville County, which uses a unique approach to jail corrections. Since 2006, Worthington has offered PASS classes to parents of youth in preschool through high school to help them be more comfortable and active in their child’s educational journey. Blanca Palma is one of those parents. She moved to Worthington from Mexico 21 years ago, the oldest of her single mom’s three daughters. Palma had to quit school to work because her family couldn’t buy school supplies. Married and a mother of five, now she’s helped her children navigate the school system with PASS’s help. Matthew Mallery came to Renville County Jail as a new arrestee in 2013, addicted to methamphetamine and homeless. The county’s trauma-informed approach to corrections, led by jail administrator Ned Wohlman, set Mallery on a new path. Mallery is now a certified crane operator and framer with Pro Framing in Sioux Falls and has been clean and sober for more than five years. Wohlman cited 30 children with an incarcerated parent at Renville County Jail as one important reason to adopt a trauma-informed approach at correction facilities. “Most people who come through county jails are good people. They messed up, but they are good people,” Wohlman said. The REACH Program is a model for academic intervention that provides students with social and emotional support to overcome personal obstacles, with an emphasis on accountability and hard work. For Hutchinson High School student Teddy Jarrell, REACH was there when she felt utterly lost. Her mother has a history of severe mental illness, which made for an incredibly difficult home life, including moving around a lot. Jarrell didn’t get to attend school regularly and said she had to teach herself to read because no one would read books to her. REACH gave her a sense of belonging. “Someone has to teach you that you are valued and you are loved,” Jarrell said. To close the day, Vanessa Goodthunder of the Lower Sioux Indian Community shared her leadership journey and passion for elevating native youth voices. At just 24, she holds a master’s degree and has served in the Minnesota governor’s office. She is currently the director of C̣aƞṡayapi Waḳaƞyeża Owayawa Oṭi – a Dakota Immersion Early Head Start and Head Start, the first Dakota Head Start in the state. Looking forward, Anderson said SWIF will continue to focus proactively on addressing the child care crisis, supporting the development of career pathways for the region’s high school students, seeking nonprofit partners that are on the front lines of closing the opportunity gap and working with entrepreneurs to grow the businesses that make communities strong. 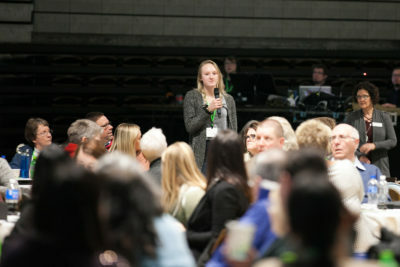 She also invited cities, churches or service clubs to request a local presentation about Grow Our Own to explore challenges and opportunities in their communities, share their ideas and learn how the foundation’s resources align with their vision for the future of their communities. Requests can be submitted to Nancy Kaping at nancyk@swifoundation.org. Southwest Initiative Foundation launched Grow Our Own in 2016 to help close the opportunity gap for kids living in poverty. This cradle-to-career strategy focuses on setting our kids up to be southwest Minnesota’s next generation of employees, entrepreneurs, community leaders, volunteers, homeowners and parents. Grow Our Own focuses on five pillars a child needs to succeed — stable families and parenting, quality early childhood experiences, engagement during the K-12 years, safe and caring communities and pathways to successful careers.